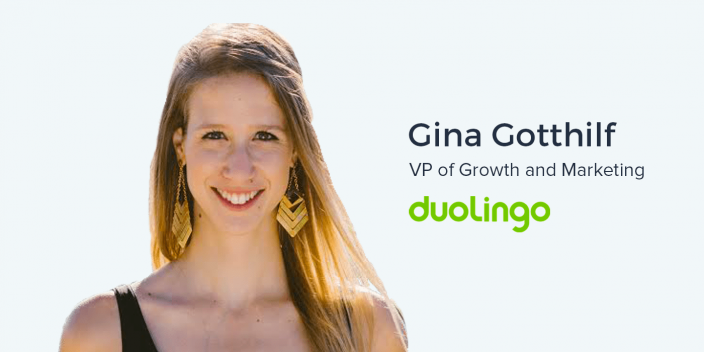 Gina Gotthilf is the VP of Growth and marketing at Duolingo, the most downloaded education app in the world. Duolingo is a language learning application that personalizes learning experiences for individual users. It has been downloaded over 170 million times. Prior to Duolingo, Gina worked in International Development for Tumblr, representing the company across Latin America. She also founded Global Ginga, a marketing agency focused on helping major U.S. brands grow in Latin American Markets. Gina has been featured as the keynote speaker at conferences around the world and has contributed to numerous publications throughout her career. She has even had the privilege of presenting to President Obama. User behavior is not universal, and acquisition efforts that work for one segment of users might not work for another. This is especially true in different countries with languages and business practices that accompany the variety of cultures across an international audience. The infrastructure and quality of technology in the developing world can also impact how a consumer audience discovers a product. Consumers love games. Any product that incorporates competition among a user community, or even users competing against themselves, is inherently conducive to acquisition, retention, and overall stickiness. “Duolingo really mimics a game. A lot of what we do we get inspiration from games. In fact, yesterday I had a big meeting with my team where we all were assigned different games to play during the week and then we discuss kind of tactics that we thought were interesting. Beyond looking for opportunities to gamify the user experience of your product with the intention of acquisition and growth, exploring unrelated or peripherally related industries can reveal unique insights that inform marketing decisions in a different way. Some marketers would claim that intuition, gut reactions, and other strictly qualitative pieces of feedback have no place in making marketing decisions. There is a place for this hypothetical thinking, however, counterintuitive outcomes proven by data are also entirely possible. Imagination and intuition are central to helping us form the correct hypothesis when testing variables of our marketing campaigns. The sophistication of the data and using it appropriately confirms or refutes what we intuit from previous knowledge and experiences. Ander: Here we are at another one of these interviews that I’m doing in New York as part of Advertising Influencers. I reached out to this awesome marketer partly because I absolutely love their app – it allows me to keep up with my Spanish and it allows me to learn some pretty basic Polish for when I’m headed to our European offices next week. It’s a pleasure to be here with her. Her name is Gina Gotthilf and she is the VP of Marketing and Growth at Duolingo. Gina, thank you so much for having me into this space, your co-working space here in New York City. Really, really great to talk to you. Gina: Thank you so much for having me. Ander: Gina, I explained a little bit about what Duolingo is is in the introduction but it’s going to sound much better coming from the person who is helping this product break through the noise in so many different ways. So, why don’t you tell us a little bit about what Duolingo is? Gina: Sure. Duolingo is an app, essentially. I mean, we have a website but 85% of our traffic comes from the mobile apps teaching languages. You can learn languages for free. Our mission is to bring free language education for the world. We have 200 million users of which 25 million are monthly active users. Gina: And we’ve grown a lot without any paid marketing. You know, there’s a lot of thirst for learning languages, especially in countries where learning English can double or triple your income potential. Ander: One of the things that I especially like about it is there’s this… I don’t know if you would call it ‘AI’ but there are these ‘chatbots’ that simulate conversations with you. It’s really, really wild. Gina: Yeah, they’re brand new and we’re working on them. We’re really excited because, you know, one of the hardest things about learning a language is figuring out how to have a real conversation with someone else. Like, it’s one thing to memorize verbs at home and then another one to show up at a café and be able to understand a question and actually come up with a response in real-time. Gina: And so people feel really flustered and don’t talk because they don’t want to sound stupid so then they don’t improve. The chat bots allow you to do that in the comfort of your own home and practicing conversational content in real-time. Ander: Mm-hmm. And one of the things that has been really, really awesome is, thata I’m doing the Spanish one right now. I tested about half way through it, and it’s just allowing me to kind of stay a little fresh, you know? I’ve lost a lot of my Spanish in the past ten years but that’s ok. You guys are really helping me out with that. So, thank you very much. I think the next thing that would be great for all of us to hear who are listening to this episode, is your professional journey. You have a very, very unique one. You did not study marketing in college, but beyond that, I’m going to let you share it. So, what is the sixty second nutshell, more or less, of your professional journey? Gina: Sure. It’s pretty unusual, I think. I studied Philosophy and Neuroscience in college. I had no idea I was going to end up doing marketing – in fact, I was kind of anti doing marketing because that’s what my dad did. Haha. Ander: Hmm! Haha. When I was in radio, my dad was also in radio… or, excuse me, in broadcasting. My uncle was also in broadcasting and both of my cousins on my uncle’s side worked in broadcast advertising. So I was like, ‘No way am I getting into that!’ and here I am. Haha. Gina: We do what’s in our blood, I guess. Ander: Yeah, I suppose so. Gina: Yeah, and I ended up working in digital marketing agencies in New York only because that’s the only internship I could get that would sponsor my H-1B Visa to stay in the United States. And I ended up having kind of a quick growth for a lot of very unusual strange reasons that I can expand upon later, and then went on to work at Tumblr where I led their growth in Brazil and Latin America. That was a pretty pivotal moment, I think, in my career. I opened my own agency in Brazil to help tech companies in the US grow in Brazil and Latin America because there was a big thirst for that at the time. And Duolingo was one of my clients. They were my favorite clients. They were so smart as a team and I love the mission of bringing free language education to the world and I love the product and it was just a pleasure working with them. And so when they asked me to come on full time to take over all the marketing, I did. Ander: Awesome. How big is the team now? Gina: We’re at around ninety people. Ander: Ok. I was figuring around a hundred, more or less. And, you guys just raised a Series E! You know, most of the time when I’m talking to quote-unquote ‘start-ups, we’re talking about Series A, Series, B. You guys are worth, like, $700 million. That’s awesome. Ander: Yeah. You said something very interesting that I’d love to hear more about before we get into the rest of our discussion here. You said there were some unusual circumstances that contributed to your professional growth. I’d love to know what those are. Gina: Yeah, I think that the fact that I had to hustle to keep my status as a ‘legal’ person in the United States really affected my life a lot because I had no choice but to really hustle harder than everyone else otherwise I would lose that status. I think that’s one. I also ended up working for someone who’s a fantastic professional but who was having some heroin issues at the time, so that’s unusual. Ander: That is certainly an unusual challenge that not all of us experience. Gina: Right. And so because of that, she would not show up to work sometimes and she wouldn’t hand things in and I was afraid that if she was fired, I would be fired because I was her intern. So I started doing her work for her… I would log in and kind of respond to her emails and then when she ended up having to go to a rehab, I actually went to Narcotics Anonymous with her in Queens which was interesting. Gina: When she ended up having to go to rehab, they asked her, you know, ‘How did you keep up with your work this whole time?’ and she said, ‘Oh, the intern’s been doing it.’ And so then they were like, ‘Ok, well, then have the intern continue handling all the major accounts,’ you know? Gina: So that, I think, was pretty pivotal. Ander: Yeah! That’s a really incredible story. I have to ask… What was the hardest part about that? I mean, there are so many things about that that are so, so difficult. What was a challenge that surprised you? Gina: In terms of an anecdote or professionally? Ander: In terms of getting the work done and taking over for somebody with this fairly significant job. Gina: Actually, the hardest part of it was just the politics inside the office, I would say. Not even the work. I really loved my clients and I loved the work. It was very challenging and I stayed in over the weekends trying to figure out how to make presentations and pictures and whatever and I was Googling things. Because when DKNY asked me to build an FBML tab at the time – if you remember what that was. Facebook had, like, tabs and you built them in FBML, which was like Facebook HTML. Gina: And of course I had no idea how to do that, but I was just always afraid that if I said, ‘I don’t know how to do this,’ then maybe I would get fired. So I was just constantly Googling FMBL 101, like, Creating Presentations 101. That was hard but it’s not the hardest part. The hardest part for me was the case that it’s just politics. The person who was in charge of me, my boss, actually was the Head of HR at the time but he was transferred into Head of Social Media just because he felt like it and he was dating someone in a leadership group. Ander: That sounds very complicated. Gina: So he just really liked taking credit for my work and making me sound stupid in front of clients on phone calls and so there was a lot of crying at that time which I know is not something women are supposed to do in offices but I did cry a lot and sometimes that still happens. Ander: And sometimes you need to do it. Gina: Yeah. I had a colleague who would come over and he wouldn’t say anything, he would just drop a Kleenex on my desk and walk away. Ander: Clearly! I mean, he sounds like a keeper for a friend there. Now, one of the things that is really cool to me about your background is you had experience in Content and Audience Development. I know that when you were at Tumblr you were in International Development doing a lot with media relations and other stuff like that. So as the VP of Marketing and Growth at Duolingo now, how did that experience with Audience Development and Content, how did that inform how you think about your role here? Gina: So as I was telling you earlier, it’s kind of weird because I don’t have an official marketing background. Gina: And so sometimes I don’t even know what I’m doing. I don’t know how to call what I’m doing. I just think, ‘What is the best thing to do now?’ and then I kind of figure it out and then I do it. For example, when I started working with Tumblr, I was doing a lot of PR. I had no idea it was PR. I was just emailing journalists and being like, ‘Hey, do you want to write about this?’ and then later I realized that there was this thing called PR and there was, like, a strategy behind it. And a lot of it I was actually doing. In terms of Content Development, I think a lot of it is the same. It’s just kind of trying to figure out what can get us to the goal that we’re trying to reach. So if it’s Facebook, for example, we want to increase our engagement or we want to drive more people to the site. Trying to think about human behavior and what’s going to lead to that and then just trying to write things as if it was for me or my friends. Gina: I think that’s very kind. Gina: I think I would call it ‘faking it till you make it.’ Haha. Ander: Ok! That works too. I mean, it sounds like what you’re saying – and this is something that I think a lot of marketers are missing, especially people who are getting into marketing now – a lot of people talk about these ‘hactics,’ these tips and tricks and ways that you can grow your email list and all this stuff like that. And I think a lot of times we forget about the psychology behind it and sometimes these things that we actually need to be doing to grow our companies or our clients’ companies are just staring at us in the face. Ander: As if we’re just looking at the user behavior and how somebody might become interested in something. And so just remembering that… keeping things really simple and using a voice to develop for that brand and kind of talking as if you’re talking to friends of yours who are following that content is the best way to go about it. Ander: Yeah! I would totally agree. And I think that another thing which is interesting about that is the qualitative components of marketing, all these very, very important KPIs and numbers that you’re trying to make happen – data’s obviously a huge part of what we do as marketers. But I think what a lot of people forget about marketing is, with all these different channels, the whole is greater than the sum of its parts when you combine everything together and you’re just looking at the psychology. Gina: Yeah, that’s true. I agree. For example, with Duolingo we’ve spent a lot of effort really crafting this voice, this persona, this brand. It’s very unique to Duolingo so everything we do has to be sort of coming from a place that sounds like a nice character and, like, quirky and kind of friendly, you know? And so everything we do has that touch. Gina: And of course it doesn’t matter so much when you’re just looking at the Facebook or you’re just looking at, I don’t know, our blog posts or if you’re just looking at our Twitter or even our PR announcements. But you know, when it’s consistent it starts building up that image in a way that is intangible. Ander: Yeah. Totally agree with that. Now, in your process as a marketer, especially since you joined Duolingo… and obviously you’ve been working with them at your agency with Duolingo as one of your clients. Ander: And so, you know, you had a little bit of context. You were aware of what the company was doing. But, when you came in full time as VP of Growth and Marketing, what was something that really surprised you coming into that full-time role versus working with them as a client? Gina: To be honest, I was terrified because they were like, ‘Oh, we want you to be our Head of Marketing,’ and I was like, ‘I don’t think I qualify. What do I have to do?’ I kind of felt like what I had been doing wasn’t going to be enough. But at that point I had developed a lot of faith in my work and results and they were like, ‘You’ll figure it out. You’ll figure it out.’ And so I guess what surprised me was that, yeah, you figure it out! Haha. Ander: Yeah! So what’s an example of, when you started and realized you didn’t know how to do something and you had to figure it out? Gina: Well, you know, for starters, on the more PR side of things, I decided that a good way to draw attention to Duolingo was to get our name in front of the press and to get stories in big media channels that talk about what Duolingo stands for and who our founder is – you know, he created the CAPTCHA and he won a MacArthur. He’s kind of a big deal guy. Gina: He decided to just focus his entire life on education, which is kind of a really cool story. And so figuring out how to do that but in, like, Turkey, India, Japan, China, Korea, and these crazy places that I honestly had never been to, that was really challenging. Especially without an agency. So who should I get in touch with? And how? And how does that work and how should I position this? That was really interesting and it worked. Ander: That is a fascinating challenge having to work with all of these different markets, all of these different geographies and really breaking through the noise there because one thing that I know about India, as an example. I believe that this is true. I heard this a little while ago. Maybe it’s still true… SMS marketing is a really big thing. It’s a huge, huge channel for a lot of people to get their product out there, to get these conversions to happen. In the US, it’s not really as much of a big thing. Gina: Right. And I think we would look down on that in the US, like, ‘Oh, we’re so past that.’ But it’s just so different and I think it’s important to go there and experience what the internet is like in these places, especially if you’re marketing an app, to understand what the app feels like because we learned a bunch. We learned that people didn’t know how to download apps, actually, in the app store. They had people who downloaded their apps for them. The internet was terrible. It was really tough. And so even in places with kind of good internet, our app just was terrible. It was a terrible experience. And so understanding how to cater to that market was a challenge. Also the fact that people in India often have their phones set to English even though they don’t speak English. Their UI is in English. Gina: Because it’s tough to type in Hindi for whatever reason. But they don’t speak English. We assume that whatever language your phone is in is the language that you speak. And so Duolingo shows up in English when you open it, and it says, ‘Learn whatever language,’ and it offers 70 million languages except for English. Everyone’s opening Duolingo not understanding what we’re saying and there’s no English course because that’s how it works everywhere else. And so we actually had to change that for India specifically and make it so that even if you’re in India and your UI is in English, you actually see ‘Learn English’ first. Ander: That’s really cool. So you actually set it up so that if you are a Spanish speaker, if your UI and everything on your phone is in Spanish, that won’t show up as a language you can learn. Gina: Right. That shows up as your UI language and then you can learn other languages. Ander: And how long has it been like that? Gina: I think almost since forever. Gina: Yeah. I don’t think that that has changed. Ander: I’m just curious to know how that might affect conversion rates or someone signing up for a language if there’s one that’s eliminated like that. Gina: Yeah, we’ve considered having things like, still offer English even if your UI is in English. We haven’t done it. We’ve just done it in India. Gina: We’re very careful about our on-boarding and about those initial screens so making changes there requires serious thought and serious A/B testing. Ander: Yeah, no kidding! Now, there are some other language learning products out there – there’s none quite like Duolingo. Duolingo’s very, very unique – but with all of these products where you’re creating oriGinal educational content – in this case it’s about language learning – what are some of the growth and marketing challenges that are unique to them? Maybe something that you’ve identified at Duolingo that’s different than other companies or other clients that you’ve worked with. Gina: When I came on to Duolingo and I started doing their social media, I kind of had my agency background in social media so I said, ‘Let’s develop content,’ you know? Like, ‘What kind of content are people interested in when they’re learning a language? Let’s develop that.’ And our CEO cracked down on that very quickly and said, ‘No, we don’t want any fluffy content that kind of has to do with language education. We only want to say things that are really relevant and that are about the brand or about the product or about the audience, the actual users. It’s just about Duolingo.’ We don’t go off and talk about ‘Top 5 Tips of Learning Spanish,’ which I think is very common normally when you’re looking at social media or generally digital content for those kinds of brands. Gina: So I think that’s one thing. Also, you know, we’re marketers; we’re not education experts. And so I don’t want to pretend to be an education expert. I am a Duolingo expert and so I can talk Duolingo and I can showcase some of the coolest things that are happening. I can showcase amazing stories from users whose lives have changed because they learned a language. Ander: Of course. Love that. Gina: But I don’t want to say it in a way that makes content marketing sound bad because we actually have Linguistics PhDs at Duolingo, but we don’t use that for marketing content. We just use the content to actually teach, not to talk about how good we are. Ander: Interesting. And I imagine this happened a very long time ago… But, what was the decision like to make this content free? Because it’s so, so good. Gina: Yeah, so free is a core part of who we are. As I was saying, our co-founder sold two companies to Google in his 20s and realized he didn’t have to work a day in his life anymore, or his kids or his grandkids. Gina: And he decided to dedicate his life to education. He’s from Guatemala where, you know, it’s a really poor country where most people don’t get to know how to read and write. And they don’t get to learn English. English is very expensive to learn because, think about in the US… Everyone learns Spanish in school but they don’t actually learn Spanish in school. You have to go to a really good school or have a private teacher or go to Spain or whatever. Go to Argentina. Ander: Spend time in a country where people speak the language. Gina: Totally. Spend time in the country. And that’s inaccessible to most people. And it’s also the case in Brazil, where I’m from, and Guatemala where, yeah, you learn English in school but you don’t learn English in school. Unless you have money, you’re not learning it. So the goal was, how can we make this completely equal and accessible to everyone in the world no matter if you have or don’t have money, and more importantly, no matter if you have or don’t have a credit card. That is crucial to Duolingo and it’s always been the case. Gina: The question there is, ‘Ok, great. That’s beautiful. You’re making things free. Then how do you make money?’ And that’s the hard part. From a marketing perspective, that change was complicated to work on in terms of content creation, in terms of PR, in terms of anything that we were doing that was on the communications front because we, at one point, went from being like, ‘Everything is free!’ and ‘We don’t charge for anything!’ and ‘We’re this great, very pure brand!’ Which we are… But we never intended to be an NGO and we have investments and so how do we position that in ways that will allow people to understand what we’re really doing instead of perceive us as, you know, kind of an undercover capitalist. Gina: Yeah, I’m saying that because we’ve had two pieces of PR that had bad titles that creeped me out over the past four and a half years that I’ve been with the company and that was one of them. Ander: ‘Undercover capitalist.’ Why did they give you that title? So Luis von Ahn, our founder, invented CAPTCHA, he invented reCAPTCHA. CAPTCHA’s those squiggly things you type online to prove you’re human. reCAPTCHA uses that technology to digitize books. So millions of books become available to everyone in the world because as you’re typing that thing – you’re typing, like, t2F or whatever – and then there’s a word like ‘box’. So you type ‘box’. And then nine other people look at that and type ‘box,’ so the computer knows, ‘Ok, this is ‘box’’. And they couldn’t read that before. Gina: So we’re helping the computer identify words from books that were illegible and that’s how books are getting digitized. Ander: That is amazing. I did not know that. Wow. Gina: Yes. So that’s really cool. And so in the same fashion, the original idea for Duolingo was similar. It was like, ok, when people are learning languages, or when people are learning in general, we throw away a lot of things that are valuable. Like, when we’re learning science, we throw away a lot of work. When we’re learning how to write, we write and then we throw that away. And math, etc. How can we use that for something that’s actually useful in society? And so Luis von Ahn and Severin Hacker, our co-founders, decided that it would be really interesting if while you are practicing a language that you’re learning, you’re also translating things that, you know, that people want to access but don’t have access to on the internet. So we were translating Wikipedia. So you learn yourself on Duolingo, like the lessons, and if you want to practice and see how much you know, you can then go to, like, a news article that came out today and start trying to translate that and then a lot of people would kind of collaborate through crowdsourcing and translate different pieces and edit each other, like on Wikipedia, and then you have a full translated piece. Gina: But it’s not true because first of all, you can avoid the whole thing. You can just learn on Duolingo and you don’t have to do any translations. It’s completely optional. And second, we talk about it openly everywhere! Ander: Yeah, I mean, I can opt out of that if I want to, as a Duolingo user. Gina: Yeah, you actually have to go and look for it. Gina: It’s not there in your face. Ander: Right. And the way you guys are monetizing now is if I make a certain number of mistakes in one exercise, then I get locked out or a day or something like that, right? Gina: So that’s one of the things that we’re doing. There’s several different things that we’re doing that are interesting. That’s our new health and gems system, which is fairly new and we’re still A/B testing. Duolingo really mimics a game. A lot of what we do we get inspiration from games. In fact, yesterday I had a big meeting with my team where we all were assigned different games to play during the week and then we discuss kind of tactics that we thought were interesting. Gina: Then you can move forward. If you don’t feel like practicing and you’re just kind of really antsy and want to get to the next thing, then you can buy more health and that costs money. That’s an in-app purchase that we’re offering now. There’s also the streak repair. That’s actually a really important growth experiment that was… not the team but the company, a concept that has really helped us grow a lot, which is also from games. Basically if you do Duolingo every single day, you get a streak. So you have, like, a five-day streak, a ten-day streak, whatever. And people really get serious about their streaks. And so when they lose their streak, it’s unfortunately very de-motivating and they give up on Duolingo altogether. That happened to me and I work at the company. Gina: You know? So, from a learning perspective it’s not a bad concept because then you don’t give up on learning, you still retain all that information that you’ve been learning because it was just yesterday, so it’s kind of like a little band-aid. Ander: The psychology behind that is fascinating. Gina: And you keep going and to so many people that’s important because that’s their motivator to keep going. So that’s another in-app purchase. We also have ads now. Gina: You know, ads are tough. We haven’t figured out, and most companies haven’t figured out a way of showing ads in a way that isn’t intrusive and crappy. But they help us monetize and keep education free forever. More interestingly, we have a test that competes with the TOEFL – an English proficiency test – that is now being accepted by over 70 universities in the US. Ander: Wow. That’s really, really cool. So, I know that at Duolingo a lot of the growth has been organic, which is absolutely awesome. To what degree have you guys engaged in any sort of digital advertising or paid media? Gina: We are just starting now. And, you know, it is true – all of our growth has been organic. But when you say all our growth has been organic it’s kind of like, ‘Oh, we just kind of, like, made this happen and we, like, hung out and watched it grow,’ you know? Gina: There was a lot of work that went behind growing it but it just wasn’t paid media. And the reason for that is that Duolingo is free and we didn’t want to go throwing money around that we so carefully raised, because we weren’t monetizing yet. And I also think that a lot of companies really rely on paid media as a crutch and then they don’t actually create products that have high enough of a retention or product market fit or whatever that will actually keep those customers that they acquire long term. And so it forced us to start making a really good product that retains users that spreads through word-of-mouth so that it continues growing, you know, exponentially throughout the years. And now we can start looking at paid acquisition more in terms of monetization. We have an LTV now, we have a lifetime value for our users. We understand that in Japan we can make a lot more money per user – especially on an iOS – than in, you know, obviously, like, Mexico on Android. So we can start focusing not only on areas that we want to grow in, but also in areas that we believe makes sense for monetization. Ander: So paid acquisition is a new experiment that you guys are going to be running. How do you see how that’s going to integrate with the rest of your marketing efforts, especially with PR? I know that that’s something that’s a big deal for you and for Duolingo. Gina: Yeah. I know I talk a lot about PR but, you know, when you have no budget and you need to make a brand grow and you actually have a really good story to tell, that was amazing for us and it really helped us a lot. In terms of paid acquisition, we’re treading carefully and we want to do this in a smart way. We want to be targeting the right kinds of people. I think, luckily, I feel confident about our product, especially with how far we’ve gone, and the cool thing is that paid acquisition is going to be a part of my growth team. Marketing and growth are kind of similar yet kind of different things, which means that we can actually impact the product. Let’s say that we felt like theoretically ads that were driving people to the app had a specific message that didn’t match that of the app and so people’s expectations weren’t met when they got there and then they dropped off. We can actually address that in the experiments. I don’t think it’s going to be an issue. I think that we’re going to cater our paid marketing messaging to the messaging that we have in the app, but we’re going to experiment with a lot of things and see kind of what drives behavior. Ander: So it’s kind of like a little mini Wild West for you guys. Gina: Yeah, for us we’re just figuring things out. And the interesting and I think probably infuriating thing about Duolingo for traditional marketers is that a lot of marketing problems become engineering problems. So it’s not like, ‘Oh, let’s talk to marketing experts.’ It’s like, ‘Let’s figure out how our engineers can automate this.’ Haha. Gina: And, you know, I’m not an engineer and I guess I’m not really a marketer, but I’m kind of a marketer, so often I’m skeptical but often they actually succeed pretty well. So for example our SEO, our entire SEO strategy, was created by a fantastic engineer with, like, a PhD in Machine Learning. And he had not done any marketing in his life and he made a huge impact in terms of our SEO results. Gina: I don’t know if that’s going to happen in terms of paid acquisition. I’ve spoken to a lot of paid acquisition experts and they are all very, very dubious that we can actually just turn that into an engineering thing. But we’re going to experiment for a couple of quarters and see how that goes. And I’m also, by the way – this is very important – hiring for paid acquisition. I’ve been looking for a Head of Paid Acquisition for about a year. Gina: And we want someone to come in and, like, really own it and work with our engineers and advise. We just haven’t been able to find that person. Ander: So for all those who are listening, Gina might want to hire you! Haha. Gina: Yeah! No, for real, like, really contact me. Haha. Ander: Yeah, for sure. That’s awesome. So in the context of everything we’ve talked about, where is marketing headed? What is the future of marketing and how can we as marketers prepare for the coming changes with marketing? There are so many things to talk about here but maybe we can narrow it down to just a few. Gina: Yeah, so I think one of the things is something I just talked about, which is automation. I think that’s happening with all the industries especially, you know, digital marketing is particularly susceptible to this because it’s digital and you can predict human behavior more and more. And, there are certain things that were only done by humans that can now be done by computers and that’s going to grow and grow and grow. So I think just being aware of that and not shying away from technology but using it as part of, you know, your tools and going a level up in terms of your thought process and strategy and actually letting the tools do some of the other work for you, I think, is crucial. Gina: Like, ‘This design is terrible. It’s blinding me. I would never recommend this.’ But our numbers were very clearly positive in terms of retention so we knew that what we had done was actually working but people were saying that they hated it. But they were actually using it more. And so we can rely more and more on real data and actually testing one idea versus another to find out which one works versus just relying on, as you were saying, intuition or opinion. Gina: Intuition helps us ask the right questions. But to answer those questions, we now have much more sophisticated ways of doing that. Gina: But now, as marketers, we are required to know exactly how what we’re doing is impacting the bottom line which I think was kind of the case but there was a lot more room for, like, ‘Oh, we’re raising awareness and that’s really hard to measure,’ and ‘It’s just very indirect and it’s really impossible to know.’ And now it’s just like, ‘No.’ The PR I do I can actually see whether or not it drove traffic to the website effectively. And I can see that on our graph. Ander: We’re accountable. Or held accountable, I should say. Gina: We’re totally accountable. We’re super accountable and also I think if you want to grow, especially in the tech world, if you want to be taken seriously you need to be data driven and data minded and talk about data in results because otherwise engineers will think that you are fluffy. And then relatedly, the last thing, working with computer engineers. Gina: It’s become a really important part of my job and I don’t think it’s the case for every company but more so everywhere because more and more things are being done online or with technology and so learning how to work with computer engineers in a way that’s productive and in a way that allows them to trust you and to respect you and allows you to best utilize their abilities is crucial. Ander: I could not agree more. And I know that we are running out of time. I see somebody who’s hovering outside of the meeting room. But Gina, this was so, so awesome. Thanks so much for taking the time to sit down and talk with us. If people want to learn more about Duolingo, learn more about what you’re working on, maybe apply for a job, whatever it is, how can they do that? Gina: So for the job, it’s duolingo.com/jobs. Tweet at me. I’m @GinaG. And follow us on Facebook because we spend a lot of time thinking about that stuff and we get an average of 6,000 likes per post which is really good. Gina: Because we haven’t bought any of that traffic and we really think about the content. So follow us! Ander: Awesome. Gina, once again, thank you so much. Thank you for having me into your office here. We’re in the Upper West Side. Gina: We’re in the Upper West Side which is actually my favorite part of the world. Ander: The world! That’s a bold statement. Ander: Especially from someone who grew up abroad. Ander: Anyway, thanks again. This has been awesome. We’ll talk to you soon. Gina: Thank you for having me.